I pretty much plan on replacing the rear body posts just about every run. It doesn't matter if my son is running the stock Ford or HPI Beetle body, they always snap. I've tried rinning the bodies high on the posts and low on the posts and they still break. I've tries hollowing out the posts a bit more and adding a rod then reglueing, but that doesn't last long. Need another solution too. Does the quality of Carson's shells vary a lot? About a year ago, I bought almost 30 of their Porsche 914 shells. These were solid, clear and fairly decent quality if not totally accurate renditions of the real car. A few months ago I bought about the same quantity. This time, the plastic was much thinner, the mold lines were hard to see and the corners weren't as tight. All in all this last batch was pretty poor. I'm working on painting several from the old batch and several from the new and there is a night and day difference. Any thoughts? The WWI you posted a link to looks to have more of a weathered paint job more than a camoflage paint scheme. Both are not too difficult to do but can be time comsuming. The wethered looks requires little to no masking, just a light touch while a camoflage paint job can be done with either no masking like the US military used in WWI and WWII or masked for a hard edge like the more modern and some other paint schemes. Lots of photo reference and a bit of time is all that's needed. Who Owns An R/c That Looks Like Their Real 1:1 Car? Any Rc Boat Fans Here? I've wanted to paint up a Lb in the traditional Vannin style for a long time. Geometrics, flames and scolops were semetrical but I've rarely seen a van with identical images on both sides. Many times the van had just one mural wraping it's way around the whole thing. I'm very interested in seeing this project. Maybe you can post progress shots as you go? I'm torn on buying one too. I really want the new Toyota Highlux but that's not going to happen any time soon. I really like the Van body of the Lunchbox, but I also love the body and driver figure of the Wild Willy and I had an original as a kid. What's every one's take on the differences between these two Re Re's? I've noticed a few posts on SIGs and looked through some of them. Why would one join a SIG? How do you join? What Model Have I Bought? Nope, not Kyosho. This is a Radio Shack truck. Tandy was another name used by Radio Shack in the 80's, I'm not sure what's accross the pond for them. I had the same truck in blue (I assume a different frequency for different colors) some time in the mid 1980s. If I remember correctly, it had a pretty good 4WD system in it. It made for a nice living room crusher as it wasn't fast, but worked. most craft stores, big department stores and some home improvement stores sell a product called Goop or Shoe Goo. This is a thick almost caulk like flexible adhesive. M-chassis Mini Cooper With Interior? Anyone know what happeded to Ol' Mike V? I haven't seen him around on any of the forums at all. PS, the Jack stands at the end of that tread were made for me. They are mini versions of the ones under my 1:1 914 right now. I wouldn't paint the whole body Chrome and expect it to last. For small areas it's fine, but I'd expect a car like the one posted above to start flaking after just a few hits or flexing. I agree. This may be the last contest I enter. So many don't bother follow the restrictions and it seems that people don't vote according to the restrictions either. So many of the paint schemes (and winners of the contests) are the same old scollops, shreds and such. 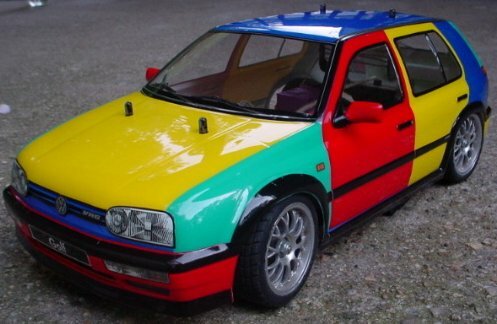 There are only a few people doing truely unique paint jobs. I'm not saying that these paint jobs are bad, but after awhile they all start to look the same. anyway, good luck 94eg.